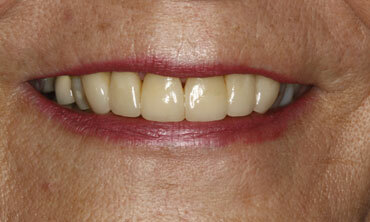 This 64 year old female was unhappy with her smile. The patient had recently broken her front tooth off at the gumline, there were " black triangles" between her teeth, and the canine teeth were rotated and tipped. 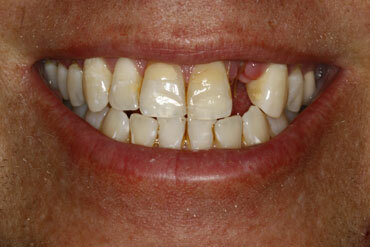 We replaced the broken tooth with a bridge and placed full porcelain crowns on the remaining front teeth. She says that she can't stop smiling with her new front teeth. This 40 year old male had two complaints about his smile. 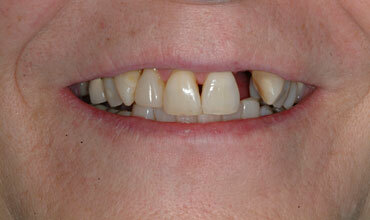 The patient's front tooth broke off at the gumline, and he didn't like the look or shape of his upper incisor teeth. 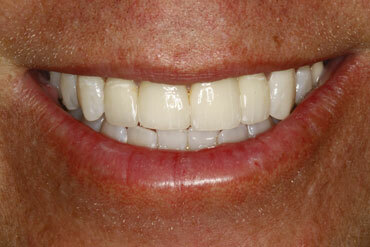 A dental implant and porcelain crown replaced his broken tooth and the remaining incisors were restored with veneers. The patient is incredibly happy with the outcome.